Midnyte Reader: Excerpt from The Demonologist by Gerald Brittle. Outside Ed Warren’s office in Fairfield County, an old chapel clock ticked away the passing moments with quiet, mechanical precision. All else stood still. It was the middle of a cold, dark night in New England. Inside the office, a brass lamp lit the desk where Ed Warren, a pensive, gray-haired man of fifty, sat working. Hundreds of books surrounded him, most bearing strange, arcane titles on the mysterious lore of demonology. Above the desk hung photographs of monks and grim-faced exorcists, standing with Ed Warren in abbey-like settings. For Ed, working in the still silence of night, it had been a wicked day—one that was not yet over. Just before the hour, the clock movement came alive in a series of clicks and relays, finally churning up three somber, resonating bongs. At the third stroke, Ed looked up, listened into the darkness, then went back to writing. It was three o’clock in the morning, the true witching hour, the hour of the Antichrist. And now, unbeknownst to him, Ed Warren was on borrowed time. Only hours before, Ed and Lorraine Warren had returned to their home in Connecticut after having been called in to investigate claims of a “haunted house” on Long Island’s south shore, in a pleasant residential suburb of New York City. In December 1975, the house had been purchased by George and Kathleen Lutz, who moved into it around Christmas of that year with their three young children. A year before the Lutzes bought the house, the eldest son of the previous owner murdered the six sleeping members of his family at 3:15 in the morning of November 13, 1974, with a .35 caliber rifle. * On January 15, 1976, the Lutzes fled from the house, contending that they had been victimized by manifest supernatural forces. It was a case that later came to be known as The Amityville Horror. By the end of January 1976, the press had become fully aware of the Lutz family’s claim of a bizarre experience in the house, and promptly called experts into the case. The experts brought in were Ed and Lorraine Warren. The Warrens were consulted because, in professional circles, they are considered to be perhaps this country’s leading authorities on the subject of spirits and supernatural phenomena. Over the course of some three decades, Ed and Lorraine Warren have investigated over three thousand paranormal and supernatural disturbances. The question the news media had essentially wanted answered was whether there was a “ghost” in the house at the time. The answer the Warrens gave at the end of their three-day investigation, however, was something no one had bargained for. Indeed, their answer literally strained credulity. What did this paradoxical statement mean? Did this imply there were other kinds of spirits than ghosts? The Warrens’ sobering information was not merely well-intentioned speculation—because fully two weeks before, Ed and Lorraine Warren had been confronted by an inhuman spirit in their own home. The visitation happened to Ed first. Ed Warren’s office is located in a small, cottage-sized building attached to the main house by a long enclosed passageway. As Ed sat working on preliminary details of the Amityville case that fateful February morning, the latch at the end of the passageway snapped open, followed by the percussive boom of the heavy wooden door. Footsteps then started toward the office. 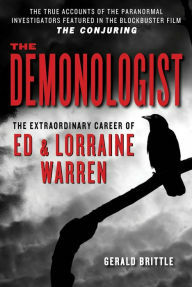 Ed leaned back in his chair, waiting for Lorraine to enter with a much-needed cup of coffee. “In here,” Ed Warren called out. Long moments passed, however, and she did not appear. “Lorraine?” Ed called out again, but there was no reply. What he heard instead, building in the distance, was an eerie, howling wind. It was not the whistling of wind under the eaves, but rather the menacing roar of a distant cyclone. Goose flesh rose on his arms. “Lorraine?” he asked forcefully. “Are you there?” But still there was no response. As the ominous swirling sound built in power and intensity, Ed quickly thought back over the last few moments. It then occurred to him that he’d heard only three footsteps in the passageway—not the continuous tread of a person walking. Something was wrong! Suddenly, the desk lamp dimmed to the strength of a candle flame. Then, abruptly, the temperature in the office plunged to that of a walk-in freezer. A rank, pungent smell of sulfur rose in the room. Suspicious of the unnatural clamor, Ed Warren opened a desk drawer and withdrew a vial of holy water and a large wooden crucifix. He then got up and walked a few steps out of his office into the anteroom. As he did, there swirled out of the passageway a horrendous, conical whirlwind. Pointed at the bottom, broad at the top, the thing was blacker than the natural blackness of night. Far larger than a man, the swirling black mass moved into the dimly lit room and drifted slowly to Ed’s left side and came to a halt some ten feet away. As Ed watched, it appeared to grow even denser and blacker than it was before! Indeed, within the swirl, he could see that something was beginning to take shape. An entity was beginning to manifest in physical form! As a demonologist, Ed Warren knew he had to act quickly, to take the initiative before this fearsome black mass transformed itself into something even more forbidding and dangerous. Holding the cross toward what was now rapidly changing into a macabre hooded spectre, Ed Warren stepped forward. The moment he did, however, the entity moved defiantly toward him! For eternal seconds the black mass stayed motionless, no more than a foot away from the cross. Then, slowly, it began to back off - though not before giving Ed a clear vision of himself and Lorraine involved in a potentially deadly automobile accident along a highway. With that, the entity, withdrew into the passageway from whence it came. An enormous sense of relief came over Ed Warren as he stood, sweating profusely, in the freezing cold room. Yet as he attempted to collect his thoughts, the vicious snarl of fighting animals suddenly erupted outside the house. Immediately, Ed realized there were no animals fighting: the visitation was still in progress. The entity had simply moved upstairs to attack Lorraine! Avoiding the passageway, Ed flung open the side door to the office and ran up the back steps of the house. He would be too late. All Rights Reserved. Reprinted with permission of Graymalkin Media (Reprint edition). * The New York Times, November 15, 1974. This is the couple the Conjuring movies are based on right? I love those.